In a mixing bowl. beat eggs, sugar, and butter. Add pumpkin and lemon juice; mix well. Combine Pamela's Baking Mix, salt, and pumpkin pie spice; add to pumpkin mixture alternately with milk. Sprinkle 1/2 cup of Pamela's baking mix onto a clean work area. Use an ice cream scoop to measure dough for each doughnut (dough will be sticky). Drop each dough portion onto the prepared work surface. Gently turn until all sides are coated in Pamela's Baking Mix and dough is no longer sticky. Use your hands to gently shape each dough portion into a circle. Press your finger through the center of each dough portion all the way through to the work surface below; move your finger around so that you create a whole in the center of the dough, about 1'' in diameter. Gently transfer shaped dough to a dinner plate. In an electric skillet or deep fat fryer, heat oil to 375 degrees. Fry doughnuts, a few at a time, until golden, about 3 minutes (turn halfway through frying time with a slotted spoon). Drain on paper towel lined plates. These Are such a delight! Easy to make, you'll trick your family into eating healthy donuts! I voted for your recipie! voted for you! love it!! These look delicious. And we love pumpkin. I love all of the seasons, but Autumn has a special place in my heart for her extraordinary foliage, and bountiful harvests. I am especially fond of pumpkins. I love looking at them, and of course eating them. My Gluten Free Frosted Pumpkin Doughnuts are one way I share my fondness of Autumn and pumpkins with my family. Many of my readers commented on my Gluten Free Unbelievably Good Cake Doughnut recipe a few months back. These are just as delicious, but with a taste that will remind you of pumpkin pie. Pumpkin pie flavored doughnuts... oh yes. I serve my Gluten Free Frosted Pumpkin Doughnuts with hot apple cider on crisp autumn weekends. 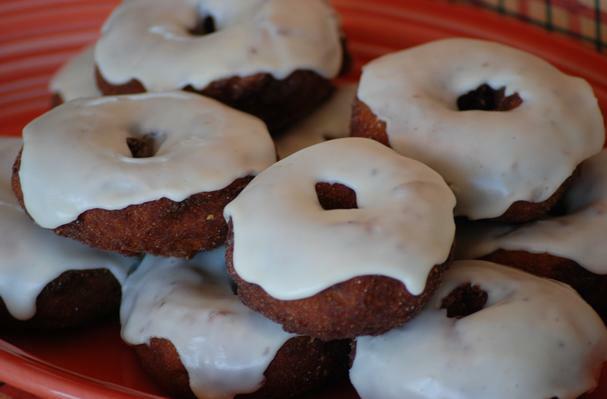 How will you serve your Gluten Free Frosted Pumpkin Doughnuts?